“Just got back from the WHOLE day at the show, we were reasonably pleased with the layouts present although, many of them seemed a long way off what I remember exhibition standards used to be, but it is around 7-8 years since I last attended a Model show, I enjoyed the trade presence and found lots of little goodies but no major purchases. One last thing, my 11 year old son has just summed his day up with ” Really enjoyed it Dad, but not sure I will go again, totally “fed up” (not the words he really used ) of being pushed out of the way by Ignorant Smelly Old Men”. Now that got me thinking and It really did hit home how inconsiderate some people can be. So I thought about making a layout just for the kids, as most exhibitions I’ve been to if they don’t supply a box for them to stand on they can’t even see the layout! 1. 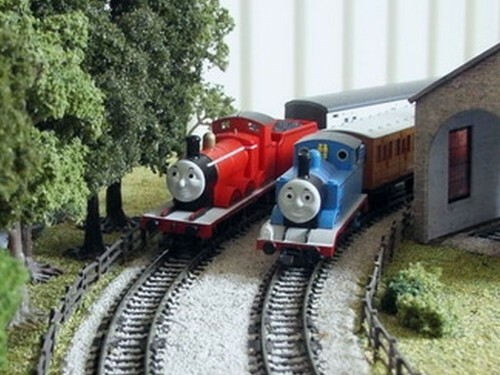 I wanted it to be amusing for the kids so I thought Thomas the tank engine and friends always onto a winner! 2. I not only wanted them to see it but also have a go a playing trains, the easiest way for me to do this was to make it DCC operated. 3. I have loads of Scalscenes kits so all buildings had to be made from the kits I had or scratch built. 4. As I already have a ‘train-room’ It had to be fairly small so I also went for N-gauge. 5. I wanted the layout to be fairly easy and straight forward so that if any parents saw it they could think, yeh I could do that. As I’m pretty sure that after they have strolled around an exhibition the quality of the layouts is enough to put anybody off, also thinking I’m never going to get anything to look like that! So that little lot was my target! 1. First the layout, fairly obvious really to me……the Hornby TrakMat, lets be right mum and dad go out at Christmas buy little Johnny his first Hornby trainset and it will be the TrakMat, it just so Happens Hornby do a Thomas TrakMat as well!! This is the OO Thomas TrakMat, the only difference between this and the other TrakMat that comes with the other sets, is the locos that are run on it! I thought this would be perfect, kids can have Thomas running about when they want to play, then dad can get his grown up locos out when he wants ago!